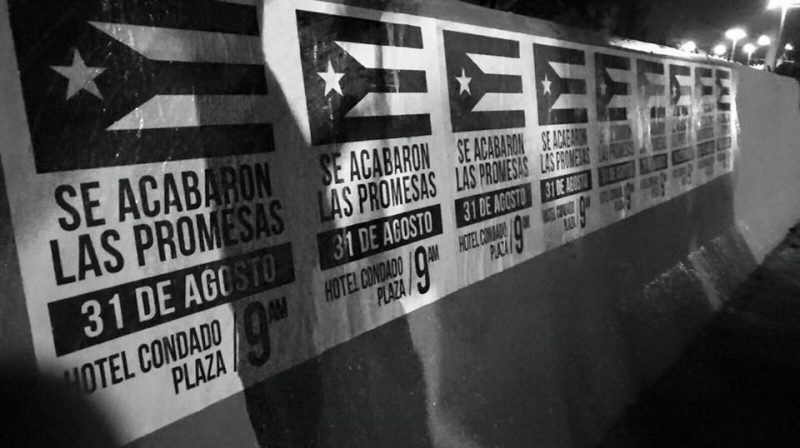 Wallposters from the group “Se Acabaron las Promesas” placed in several cities in Puerto Rico informing citizens of the protest that took place on August 31. Photo from Jornada's Facebook Page. Used with permission. August 31 is now remembered as a day of victory in the struggle against the US-imposed Fiscal Control Board in economically fraught Puerto Rico, despite that struggle having only just begun. Late last month, US President Barack Obama announced the seven members of the imposed board, as part of an extended austerity campaign Washington is pursuing in the territory amid a growing debt crisis there. 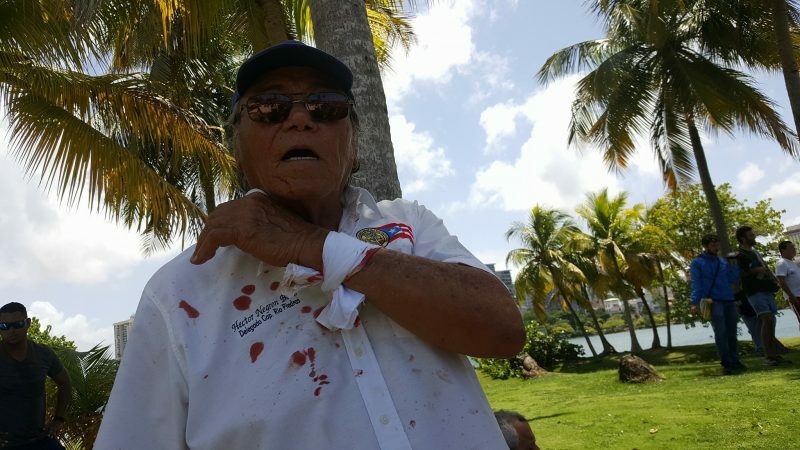 But Puerto Ricans are more likely to remember the day for a clash between police and protesters during the first PROMESA Conference outside the Condado Plaza Hilton, which was cancelled after the violence. The conference was slated to include several panels on the island's economic development under the Puerto Rico Oversight, Management, and Economic Stability Act (PROMESA, which in Spanish means promise). Financial experts, business people, and politicians were among the guests, and the conference also included a discussion for bondholders. Given the fact that the Control Board's priority is to assure that payments are made to investors, and that its very existence represents a US imposition that bypassed democratic consultations at the local level, grassroots activists called for action to prevent the meeting from going ahead. The PROMESA bill created the Fiscal Control Board with powers that will override those of the government of Puerto Rico, including its Constitution. Two members of the board, Carlos García and Jose Ramón González, were former presidents of the Development Bank under different administrations. García's appointment was of particular concern to Puerto Ricans, since he was one of the architects of Act 7, a law passed that eliminated thousands of government employees in 2010. The 1st PROMESA Conference was sponsored and organized by the Puerto Rico Chamber of Commerce, Birling Capital Advisors, LLC, Select Global Advisory Group, LLC, and local newspaper El Nuevo Día. 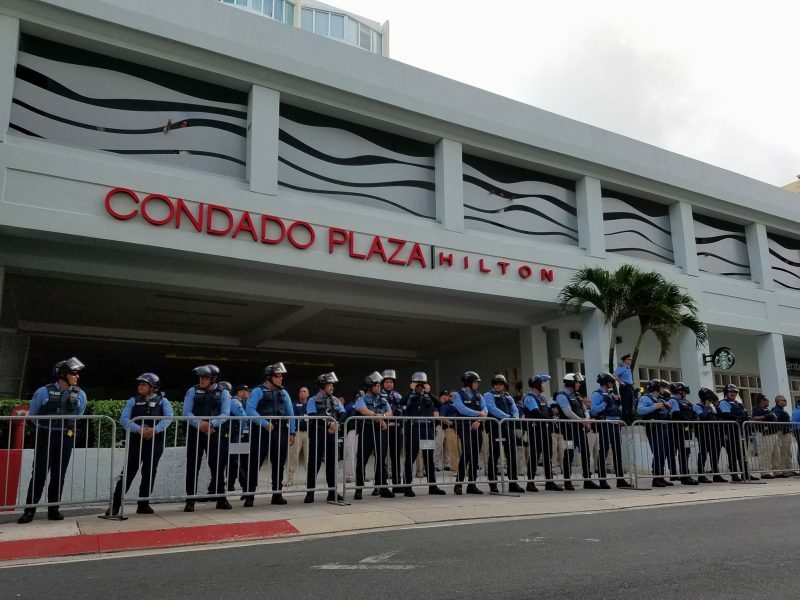 Police officers were lined in front of the Condado Plaza Hilton Hotel early in the morning. Photo from Juventud Trabajadora-PPT's Facebook page. Used with permission. Protesters line up in Ashford Ave. to prevent entrance to the conference. Photo by Juventud Trabajadora-PPT's Facebook page. Used with permission. The group Se Acabaron las Promesas (Promises are Over) used social media to encourage activists to mobilize against the conference. Tensions with authorities had begun days earlier when six activists were arrested at the headquarters of GFR Media during a civil disobedience protest. GFR Media publishes El Nuevo Día, the largest newspaper on the island that supports PROMESA and the imposition of the Fiscal Board. 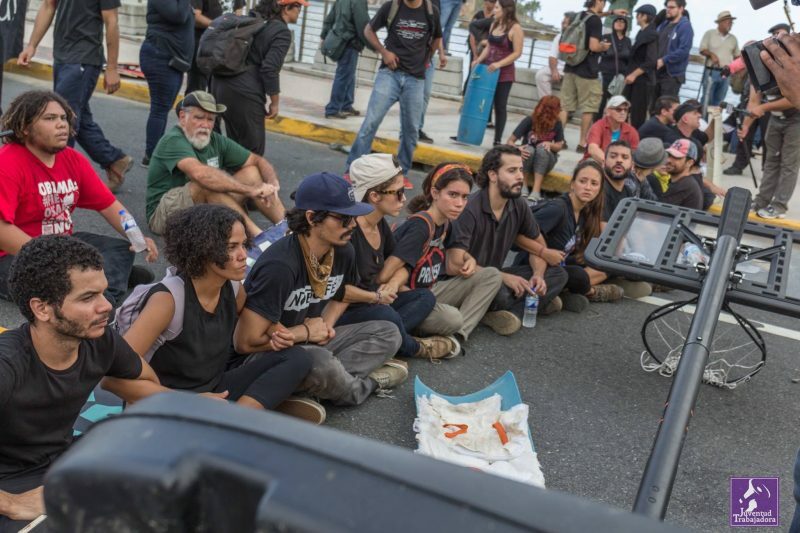 Activists from “Se Acabaron las Promesas” and “Campamento Contra la Junta”—the camp of activists located outside of the federal district court in San Juan—used Facebook to update followers on the arrests, including a list of those who were arrested and footage of the event. Protesters hold hands in an attempt to block entrance to the conference. Photo from Juventud Trabajadora-PPT's Facebook page. Used with permission. 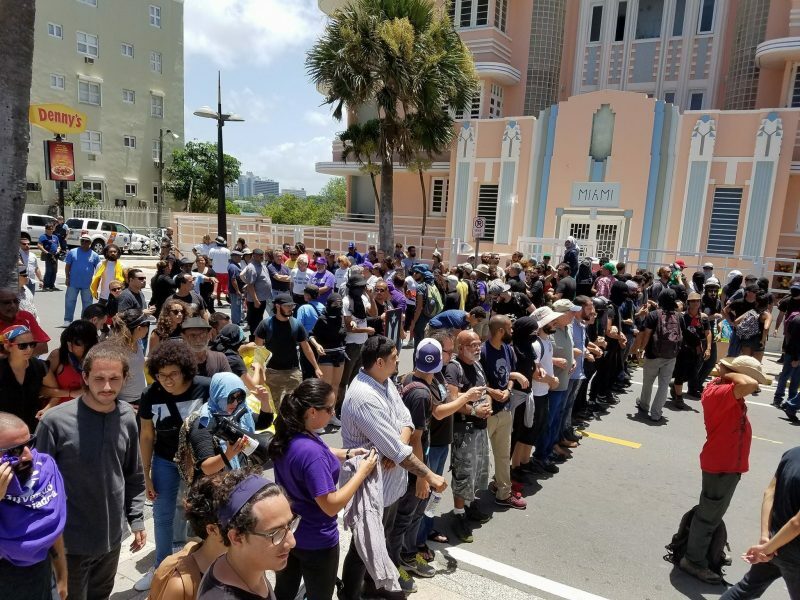 Since early August, activists of “Se Acabaron las Promesas” were protesting the PROMESA law, but the protest that took place in front of the Hotel Condado Plaza received the most media attention and also criticism from traditional news outlets in Puerto Rico. The plan was simple: to interrupt the conference and publicize their dissent. The avenue was blocked by protesters who arrived early in the morning to find the police riot squad lined in front of the hotel. Se Acabaron las Promesas and the youth organization Juventud Trabajadora-PPT were two of several groups publishing live videos. The protest culminated when activists met face to face with policemen on a nearby bridge. In a tremendous display of strength and unity, activists pushed the riot squad back. As officers attempted to disperse protesters, many involved were injured, but some news outlets and commentators blamed the demonstrators. 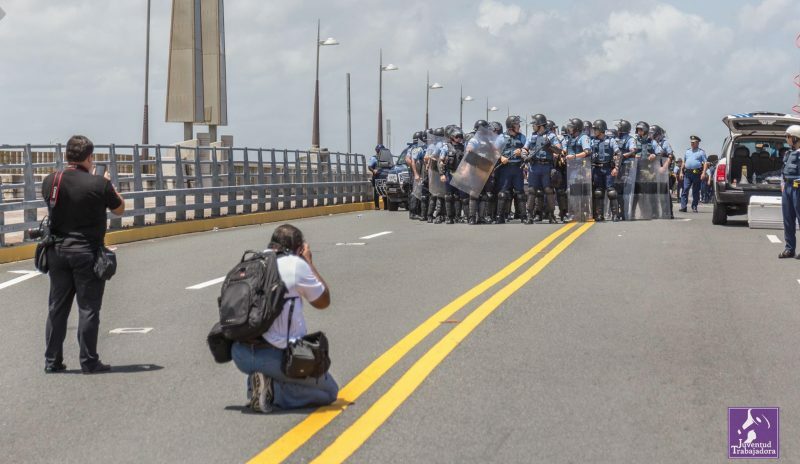 Photographers take pictures of strike force preparing to disperse protesters in Dos Hermanos bridge. Photo from Juventud Trabajadora-PPT's Facebook page. Used with permission. Attorney and activist Alvin R. Cuoto de Jesús filmed several videos that are now published in the digital magazine 80grados. Footage shows how protesters were trying to convince officers of their just cause, and various trade unions and other social movement organizations joined the demonstration. De los momentos más parapelos del día. Cuando en unísono lxs compas finalmente lograron hechar la fuerza de choque hacia atrás luego de aguantar un bombardeo de macanazos. Los guardias entonces respondieron rociandolos con gas pimienta. Es una pena grandísima ver a nuestros hermanos policías puertorriqueños siendo utilizados como peones para reprimir a su propia gente, mientras sus dueños siguen haciéndose de las suyas. Por el otro lado, igual da una sensación muy poderosa ver a un pueblo levantarse contra la opresión. One of the most perplexing moments of the day. When in unison fellow citizens finally pushed the strike force after they were being bombarded with blows, the officers responded by spraying pepper spray…It is a huge disappointment to see our fellow Puerto Rican policemen brothers being used as pawns to repress their own people […] On the other hand, seeing your own people rise up against oppression is a powerful feeling. Photo of injured protester, by Ricardo Jose. Used with permission. 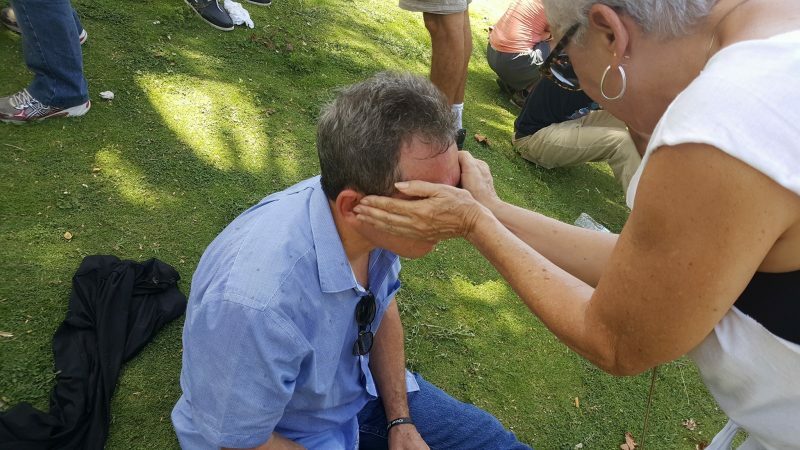 Woman helps a man who was sprayed with pepper spray during the demonstration. Photo by Ricardo Jose. Used with permission. After a long hot day filled with tension, the conference's cancellation was announced. Most guests were not able to attend the event and the Centro de Periodismo Investigativo published a photograph of a nearly empty room inside the conference. “Se Acabaron las Promesas” joyfully claimed victory, as the demonstrators, reportedly around 300 people, successfully interrupted the conference. “Se Acabaron las Promesas” declared that this is only the beginning. 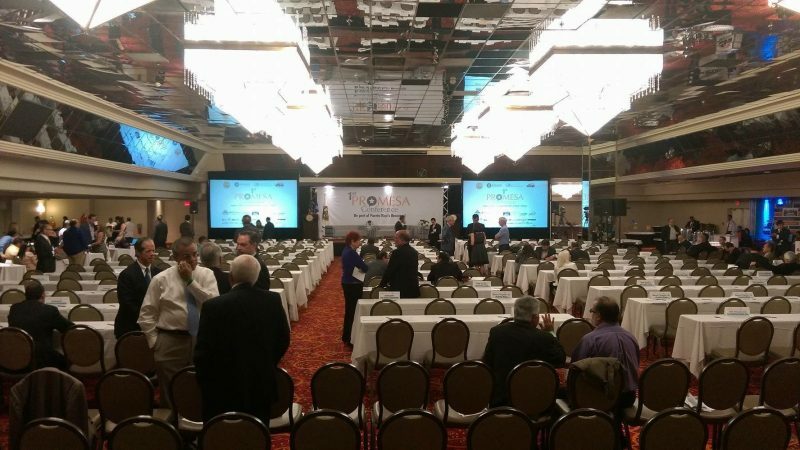 Inside 1st Promesa Conference in Condado Plaza Hilton Hotel. 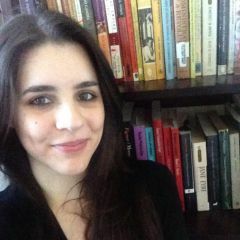 Photo by Eliván Martínez Mercado for Centro de Periodismo Investigativo. Used with permission. Last time I was in PR, locals told me all their skilled workers were fleeing to the mainland. Any revitalization is going to have to include their being enticed to return. PR government mismanagement, covered by borrowed money has its limits, that being the when it becomes clear that the total government debt is more than it will be able to pay it all back. That is when the lenders stop lending new money and the government then cannot pay all of its day to day bills.